The Flying Pigeon LA bike shop is proud to partner with Streetsblog LA and the Los Angeles County Bicycle Coalition to produce a NELA bike-stravaganza weekend. We are kicking off our bike-crazy weekend with a fundraiser ride and party for Streetsblog LA on Friday, June 14, 2013 at 6 p.m.
On Saturday we’re hosting a tour of local raspaderos (Mexican fruit-based shave ice and milkshake shops) along N. Figueroa St. with a Raspados Ride on Saturday June 15, 2013 at 3 p.m.
Our wild wheeled weekend will wrap up on Sunday morning with our Good Morning Vietnam Ride (a special version of our Get Sum Dim Sum Ride) wherein we will ride to local Vietnamese-American fusion restaurant Good Girl Dinette on Sunday, June 16, 2013 at 10 a.m.
All these rides are free-of-charge, low mileage, slow paced and an excellent opportunity to share this most excellent community with others. Meet at Flying Pigeon LA bike shop. Ride departs at 6:30 p.m. Mellow tour of N. Figueroa St.’s history as well as future plans for buffered bike lanes. Free of charge. 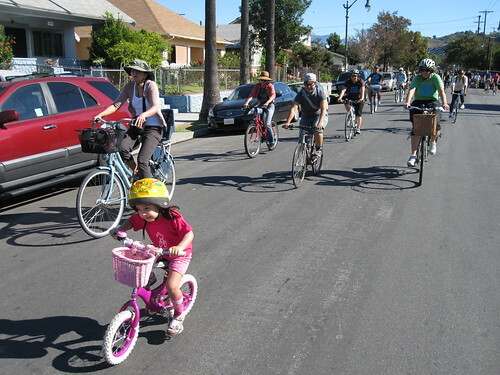 Any rental bike revenue ($20 to rent a bike & helmet) will go directly towards Streetsblog LA. Cake! Food! Music! Fun! $10 suggested donation. Meet at Flying Pigeon bike shop. Ride departs at 3:30 p.m. and returns around 6:30 p.m. Slow-paced tour of 3 or 4 raspados shops. Our community is blessed with several shops that sell fresh-made fruit ice cream (helados), fruit blended shakes (liquados), and the magic bionicos (yogurt-fruit cups), as well as syrup flavored shaved ice (raspados). Ride is free of charge, raspados are not! Bring cash! No bike? No problem: rent one of our single-speed cruisers for $20 (includes a helmet) or our three-wheeled cargo bikes (bring the kids or abuelita!) for $40. Meet at Flying Pigeon LA bike shop. Ride departs at 10:30 a.m. and returns at about 1:30 p.m. Slow-paced ride to Good Girl Dinette in Highland Park to sample their new breakfast menu of Vietnamese-American dishes. Ride is free of charge. Good Girl Dinette accepts cash and credit.